The bathroom as one of the important facilities in the house which always used every day. The bathrooms are created to be convenient for users. Master bathroom design must be designed to the size, type and condition of the bedroom. The main bathroom interior design begins with the main sanitary rearrangements and planning bathtub, sink, shower and closet. 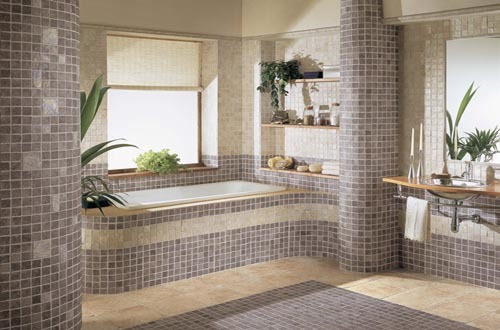 The concept of comfort in the design of the bathroom with the separation of wet and dry areas. Wet areas including shower and closets, while the dry area includes a sink and bathub. Bathub as a central element in a bathroom as a vocal point shown in the placement. Once open the door that looks is where it soak and shower. While the wet area is located behind it. By using the transparent wall separated with tempered glass and decorative walls. This decorative wall in the form of field L as bathroom interior design solutions. Bathub placed right in front of the sink that flank the entrance. The use of transparent walls for storage and use of furniture toiletries on the sink area is an interior design solution that fits in the master bath. Interior design solutions in an atmosphere that would be created with a selection of finishing walls and lighting. Overall this bathroom, the walls were finishing granite travertine. Floor using granite stone travertine combined with roasted impala black granite. The main ceiling is likely flat, decreasing only above wastafel. Placement and selection of dim lights give a comfortable and relaxed atmosphere in this space.